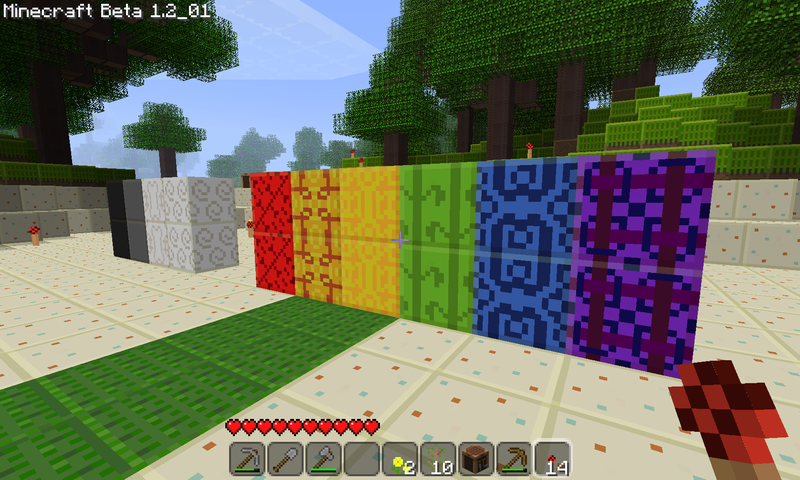 The latest release of Minecraft introduces several new things that need textures: coloured wool, sandstone, the displenser and some refinements to the appearances of trees and furnaces. I have had a go at adding them to my GroovyStipple and SmoothStipple texture packs. 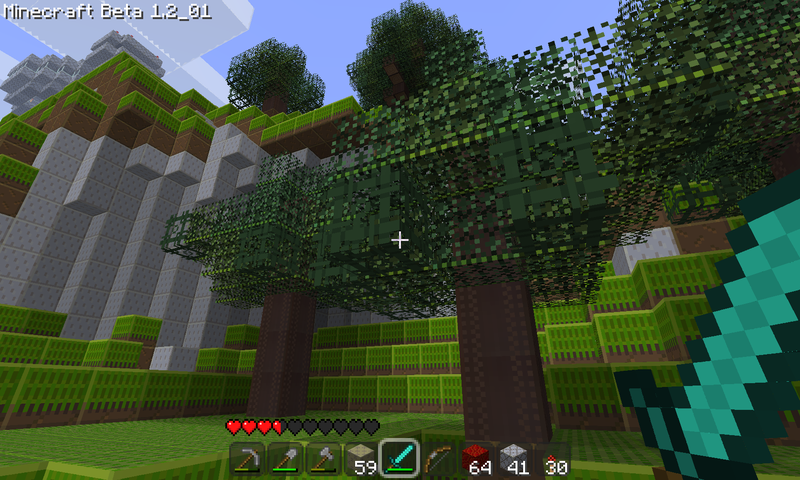 I have hastily updated the pack to cover the new terrain textures for Beta 1.2. The dispenser was simple enough. For the dyed wool I wanted to do something slightly fancier than just tinted versions of my existing wool texture: I am pretending that the dyeing process involves weaving and produces patterned cloth. This way you can use wool to make carpeted areas. That‘s the theory anyway; I find that creating 16×16 patterns that tesselate well and look nice is tricky. This is just a first attempt. 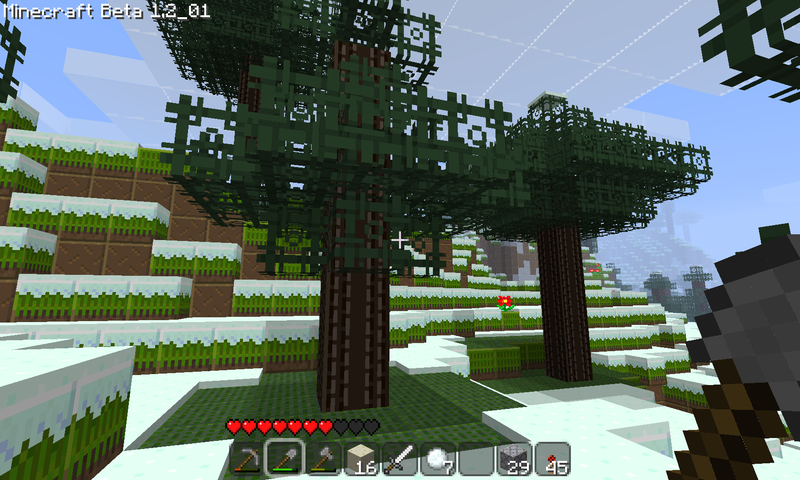 Beta 1.2 introduces new styles of tree. In the texture pack this entails two new log textures, for pineœ and birch, and a new leaf texture, which I think is also mostly for pine. 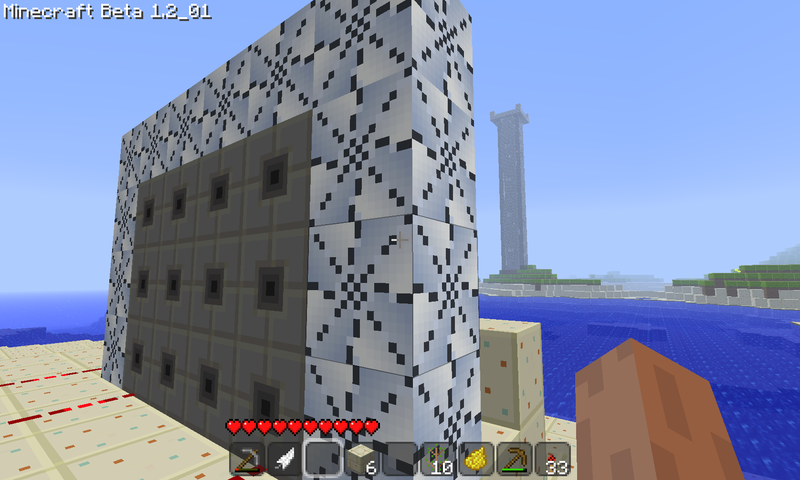 I have first stabs at these textures. I am not happy with the way the birch has turned out: there is a balance between looking like real birch bark and fitting in with the GroovyStipple stylized stippling that I have not found yet. It looks a bit kooky. Probably I should recycle it as a wool ‘weave’ and rethink the leaves. 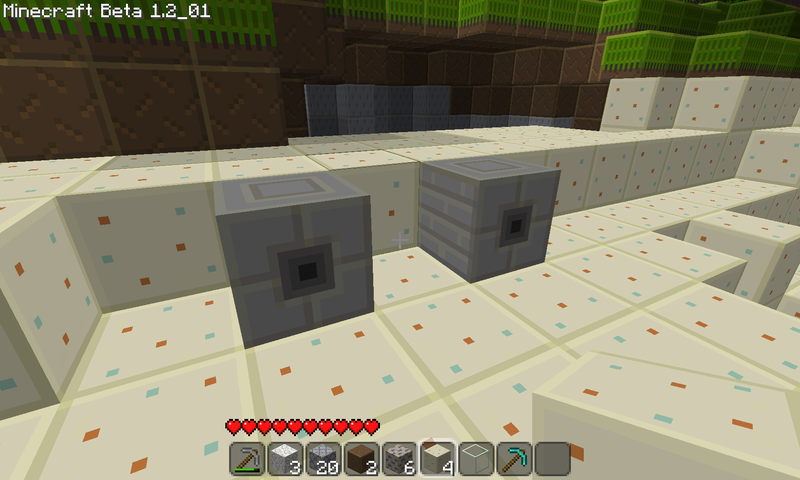 While I was at it I redrew the texture for diamond blocks. This one is impossible to get right, because the whole point of diamond is its exceptional clarity and the reflections and refractions, none of which is easy to represent on an opaque block. Before it became necessary to reissue the texture to address Beta 1.2 I was experimenting with updating some of the mobs’ appearances. 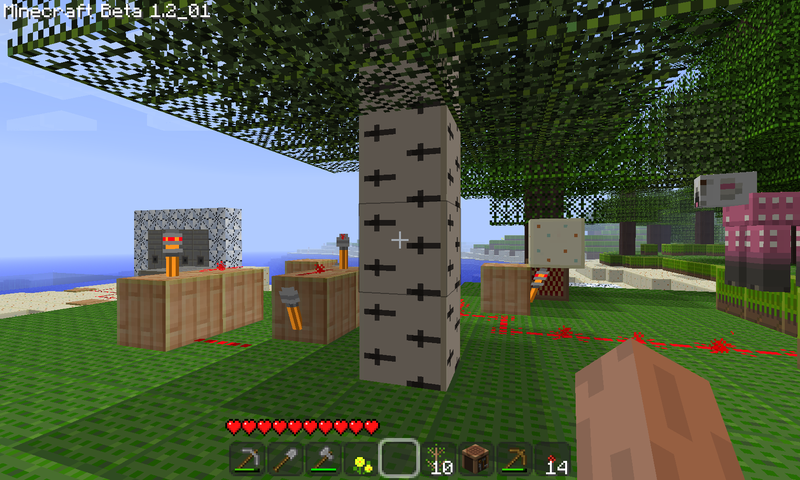 Apart from the sheep mentioned in my previous article, I have added a cow, zombie, and creeper. I haven‘t got a good shot of a zombie or creeper, but here is what cows now look like. 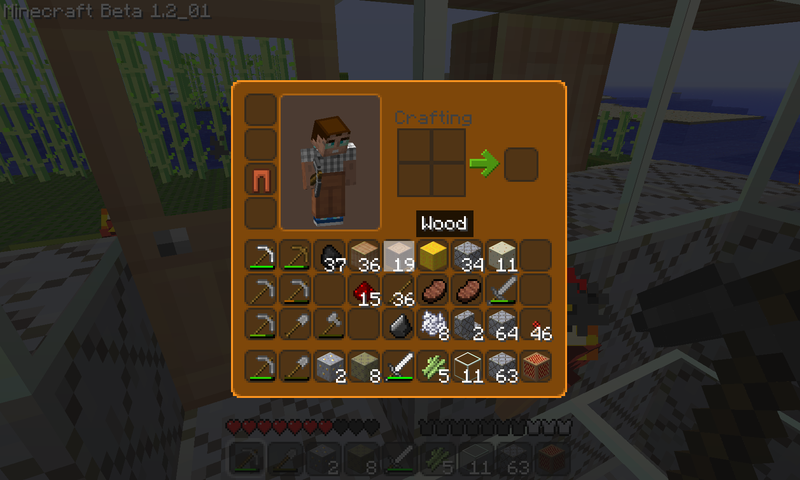 The other thing I have changed is some of the so-called GUI elements, such as the overlays used for the inventory and similar. If anyone out there actually uses this pack then this is the thing most likely to annoy them.